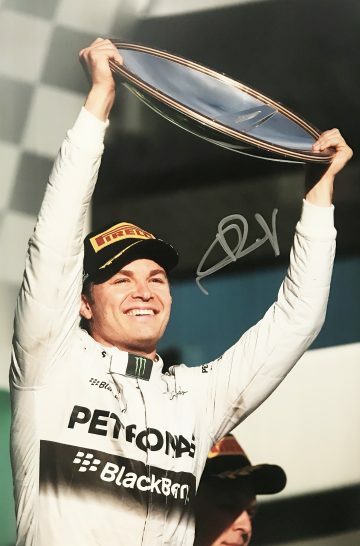 Signed Nico Rosberg F1 Memorabilia including autographs, signed Nico Rosberg shirts, photos, caps, visors and other Formula 1 related merchandise. All come with a certificate of authenticity, fast worldwide shipping and free UK delivery, many come with photo proof! Formula One world champion Nico Rosberg is a firm fixture in the F1 hall of fame. Now retired, his short yet illustrious career produced an astonishing 23 wins, 57 podiums and 30 pole positions. Rosberg was born in Germany to a Finnish father and German mother – he holds dual nationality for this reason. He spent much of his youth however in Monaco – a childhood that was shaped around his grandfather and Formula One champion Keke Rosberg’s love for racing. He began karting aged 6, quickly moving through the ranks before being picked up by Williams for an F1 test in 2004. In 2006 he became a permanent fixture in the team and tasted his first success in F1. During their mandatory Engineering Aptitude Test he achieved the highest score in the team’s history. Throughout his career Rosberg has faced and efficiently dealt with challenges and uncertainty of racing at top flight. And he is known for his dogged determination and remarkable breakthroughs at every stage of his career. In 2006 as he entered Formula One for the very first time he made waves in the competition, finishing seventh despite being stuck with a car that was not considered fast enough to reach the podium. Not only that – he simultaneously recorded the fastest lap – making him the youngest driver to do so at the time. 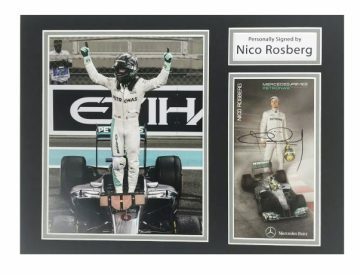 Our collection of Nico Rosberg signed F1 memorabilia offers something for everyone. Whether you’re a die-hard fan or simply a sporting enthusiast, this selection of ephemera commemorates Rosberg’s numerous achievements over the years. 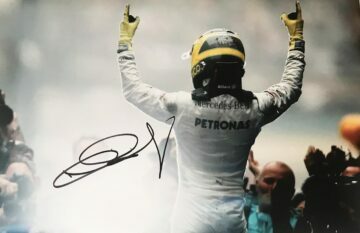 Here you’ll find signed Nico Rosberg caps, visors, clothing and photographs signed by the man himself. Each item is supplied with a certificate of authenticity, sourced directly from our trusted partners.